Burbank dental all-ceramic crowns are modern dentures for teeth. They are made of dental ceramics of high strength and do not have metal in their construction. Such crowns look natural and practically do not differ from real teeth. 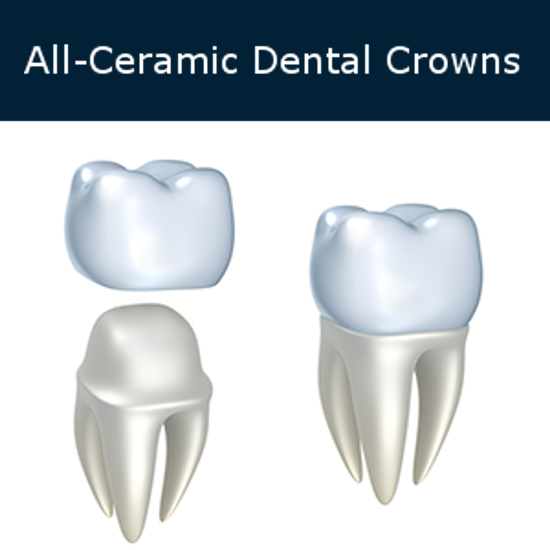 Dental all ceramic crowns are a type of cosmetic crowns. They are installed both in the smile zone and on the chewing teeth. This is due to the increased aesthetics of these orthopedic structures. Dr. Sahakyan at My Dentist Burbank recommends prosthetics with all ceramic crowns in most clinical cases. The reason for this is the complete biocompatibility of this material. This means that the crown made of all ceramics is not perceived as a foreign object and does not have a toxic effect on the tissue. Burbank ceramic crowns do not cause the patient unpleasant sensations in contact with temperature or chemical irritants. The installation of artificial teeth made of all-ceramics for patients with allergic reactions to metals is performed without problems. Please contact Dr. Sahakyan at My Dentist Burbank, if you need all-ceramic crowns. Our dentist will choose the correct material for your dental crown. Call 1-818-578-2332 for an appointment today. Zirconia crown is a type of all-ceramic crown. These crowns are one of the most reliable, aesthetic, safe and durable methods of restoring teeth in dentistry. Such crowns can withstand the load in the area of the front and side teeth. Why Can You Choose Zirconia Crown? Zirconium crowns are very durable and can last a lifetime. Burbank all-ceramic crowns E-MAX are made of glass ceramics – a material based on lithium disilicate, which is completely biocompatible. 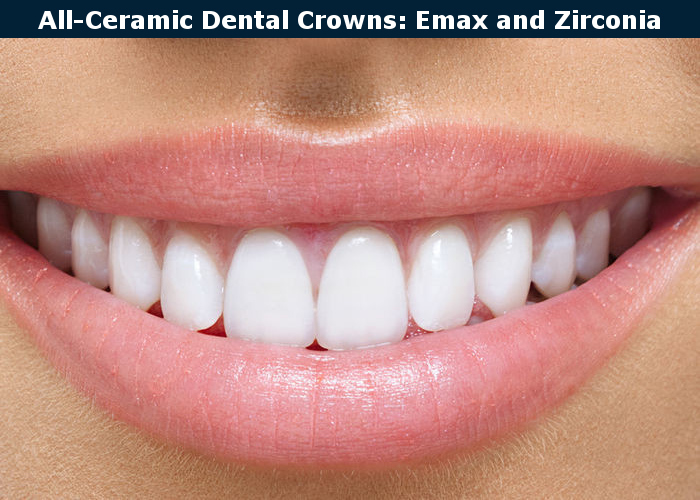 Ceramic crowns E-MAX is extremely durable, very beautiful and, at the same time, show excellent functional qualities. E-MAX crowns are one of the most universal and at the same time high-quality single prostheses. They practically do not have weaknesses from both the functional and the aesthetic side. The Burbank dentist can adjust the color and transparency level of the crown. The result is a complete external correspondence to the natural dentition. You can install E-MAX all-ceramic crowns on the front teeth and make your smile just luxurious. It can also be installed on the chewing teeth, which will give you the opportunity to easily chew any food. Due to the material and manufacturing technology, the strength of the E-MAX crown is very high. E-MAX all-ceramic crowns are equally successfully used to restore all types of teeth. This ceramic crown has good biocompatibility and is completely hypoallergenic. The service life of E-MAX crowns last long time. All-ceramic crowns Burbank look extremely effective precisely due to the lack of metal. Metal often gives the tooth a greyish shade. A moderate transparency and natural fit to the gums of the crowns of all-ceramic crowns make the teeth as natural as possible. The ceramic does not change its color under the influence of various dyes throughout the life of the product. It does not cause darkening of the gums. All-ceramic dental crowns never cause any reactions due to the biocompatibility of materials used. They are absolutely safe for allergy sufferers. Just one visit placement is possible. Your all-ceramic crowns will fit at the first time, and no additional adjustments will be needed. If you need an all-ceramic crown, first of all, consult Dr. Sahakyan, the best dentist in Burbank, at My Dentist Burbank. Call 1-818-578-2332 for an appointment today. All-ceramics are practically airy material in comparison with heavy metal. You get used to it very quickly. These dentures are very comfortable during wearing. Ceramic crowns are strong enough to withstand small loads. Such crowns do not crumble, do not absorb dyes, or crack. How Long Will the All-Ceramic Crown Last? The service life of ceramic crowns, installed in the dental office of Burbank, is practically unlimited. Crowns, themselves, can withstand even a high load when chewing food. The arising chips are easily restored by polishing. Crown installation is a type of restoration when a special prosthesis which is made in the laboratory covers the entire visible part of the teeth. This type of prosthesis is used, to restore the functions of the tooth and its anatomical shape. Before the installation of all-ceramic crowns, the dentist Burbank conducts the necessary sanction and dental treatment. At first, the dentist cleans and reshapes the tooth to be treated. Then, the tooth is tapered. It allows the crown to fit cosily over the top. The impression is made on the basis of which the dentist creates a crown. The color of the crown is selected on a special scale together with the patient. When it is ready, the dentist installs your new crown. The crown is firmly fixed on the dissected tooth with dental cement. Take care of your new crown. In order to maximize the life of your ceramic crowns, it is recommended to follow simple hygiene rules. Brush your teeth at least 2 times a day. Dr. Sahakyan at My Dentist Burbank recommended to use special rinse aid for the oral cavity after eating. Also, remove food residues from the interdental spaces. Try not to eat hard foods – nuts, seeds, etc. If you follow the recommendations of Dr. Sahakyan, at My Dentist Burbank, your crowns will serve for a long time. If your tooth has been decayed or cracked, an all-ceramic dental crown is an excellent way to restore it. Dr. Sahakyan at My Dentist Burbank will choose the correct material for your dental crown. Call 1-818-578-2332 for an appointment today and we will assure the aesthetic appearance of your teeth.